Mevio Shows & Channels, Now Embeddable! A new feature just released on the Mevio site is the ability to embed videos, shows and channels found on the site in other locations. I thought I should test it out… so enjoy Amy Mac’s Fit Life below! 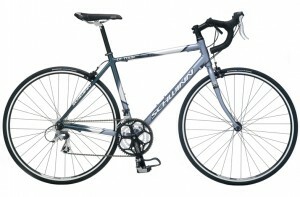 Here it is, my new road bike. It is a little odd riding a road bike considering I have ever only ridden a mountain bike, but I am starting to get used to it. I have only been out on a few rides, but it is an amazing bike. It is fast and is pretty comfortable. The goal is to ride this a few times a week (evenings and weekends) until the shin splints go away and as a cross-training tool. The next step is to start riding it to work. Not a big deal in distance (its only 3 miles to the train) but the ride from the train to the house is the tough part. It’s uphill, foggy and dark by the time I get home in the evenings… which doesn’t sound like a safe thing to be doing to me. Not a whole lot of news here, just excited to own the bike and wanted to blog about it so I could remember it when I am old… that is, of course, one of the goals of this blog… to remind me of all of my adventures when my brain gives up on me. Status Update, Where Am I? It has been a crazy few months so I thought I would give another quick update. The marathon training has been going great. Logging lots of miles, until, I got shin splints. I have been not running for the last week or so and have been trying to stretch and relax a bit to ease the pain. It was probably a good thing though, because I had a LOT of work to do last week as PodShow released a major upgrade to the site, as well as a name change to Mevio. So a little bit about the name change. PodShow, the company I have worked with for the last 3+ years, has re-branded to Mevio (found at mevio.com of course). There were many reasons for this but I don’t really need to get into all of that here. If you would like a great take on the transition from one of our producers standpoints, you can check out the GeekBrief blog with Cali Lewis. She wrote up a great post on it. I am excited about the changes happening at the office and am looking forward to where the company is going. What else? In August, Amy and I will have been married for 7 years. At that time, we will be taking our first official vacation as a couple! We have taken a weekend here and there, or went home to Tennessee for a week but still working regular hours, so this is a pretty big deal for us. We will be taking off to Hawaii (Kauai and Maui I believe) for around 10 days and if the timing works out, maybe a trip through Las Vegas on the way back to attend the Portable Media Expo… we will have to see about that one, though. Other than that, I guess it is work as usual. Long days and nights trying to build the best online entertainment hub on the planet :) Stay tuned for more updates and photos, I have lots of them but no time to post regularly. Nick and Amy are both up to some amazing things that I can not talk about yet… but soon! Who is this Scott Sigler guy, and how is he infecting the world so quickly?! Find out more about his new book, Infected, and buy a copy now! 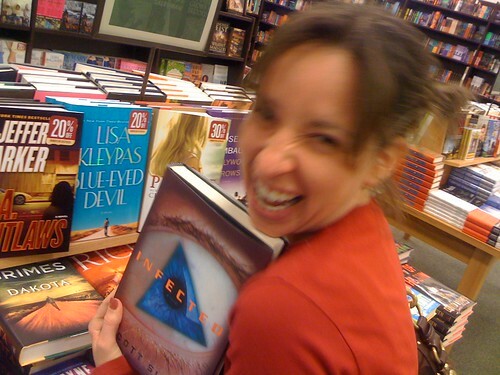 Even Amy Mac was infected upon seeing the Infected book right inside the door of Barnes & Noble. Keep up the great work, Scott! Ultimate Warrior — uhhhh… what? I watched WWF Wrestling as a kid. I think most boys my age did, it was the cool thing to do (along with G.I. Joe, Thundercats, Vultron and the like). So if you are a child of the WWF era and loved all the drama that came from wrestling back in the day of Hulk Hogan, Sgt. Slaughter, Hacksaw Jim Dugan and the rest of those chumps, enjoy the following video. This is a sudo-documentary about how nobody understood what the hell he was talking about in all of his rants. Watch the Original Video Here!